When I first received Yellowcake in the mail the first thing I saw was the cover (duh). I thought it was so pretty, very bright and quite unique….then I saw the author’s name and I dropped the book like a hot potato and ran away to hide. Now you’re probably wondering, “What did poor Margo Lanagan ever do to you??”. Well, nothing really, but quite recently I read her multi award winning novel, Tender Morsels and basically….I found it quite disturbing. That experience indicated two things – that Margo Lanagan isn’t afraid to push the boundaries when it comes to content and her writing is powerful and will evoke strong emotions (where or not you like those emotions, will depends on the story). Without much of a blurb to tell me what this collection of ten short stories was about, I was convinced to give the book a try and stop being a baby by other bloggers and fans of Margo’s work, as well as some gentle encouragment from the author herself (gotta love twitter). By the end of the book I was pleasantly surprised. Yellowcake is an example of the skill it takes to write an engaging story in only 20 pages. Most standard novels need that much or longer before the reader starts to become interested. Each story is unique and separate from one another and covers a range of time periods and places, with their own weird and wonderful characters. Some you wont understand till you reach the end of the story….some you might not understand at all (sorry Margo), but there will be some you’ll find completely fascinating which will leave you with that ‘nooo it’s over already!’ feeling that comes with short stories. My favorite stories were – The Golden Shroud, A Fine Magic, Night of the Firstlings, and Ferryman. Yellowcake is a collection of stories that has something for everyone. Lanagan’s writing style is completely unique and sometimes on the strange side so those unfamiliar with her work might not be completely sold. For those who had a similar experience as I did withTender Morsels, I can assure you Yellowcake is far less confronting. 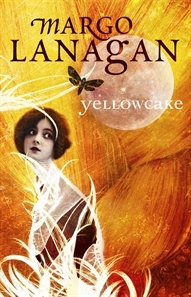 If you’re already in love with Lanagan’s style then Yellowcake will be a must have addition to your collection.